Shaula is big into BookCrossing. The problem with BookCrossing, IMO, is that hardly any gadgets are required to participate. All you need is an Internet connection and a book. Geocaching is more my speed. Required gadgets: GPS, PDA (to run favorite mapping/logging software), digital camera (to record the happenings), compass, Internet-capable device, car or other transportation system. Some people manage to reduce this down to the GPS and Internet but obviously they just don’t get it. I’m trying to figure out how to incorporate MORE gadgets into the process. After hearing about geocaching off and on for awhile we encountered a pair of ‘geocachers’ on a train in Norway, Oslo to Bergen. They were very enthusiastic about the, uh, sport and some of their enthusiasm rubbed off on us. Today we decided to give it a try. Geocaching in a nutshell: Go to the geocaching web site and locate a nearby cache at an interesting location or with contents you want. Use some mapping software to pin the latitude/longitude coordinates on a map andwork out how to get close. Get there, then whip out the ‘ole GPS and start walking to the target coordinates. This is where it gets tricky since it is unlikely that you can walk straight through buildings, rivers, fences, thick underbrush, etc towards the target and your average GPS unit isn’t going to know much about these features or how to get around them. After resolving this you’ll have to deal with the reality that GPS precision, both yours and the person who placed the cache, is somewhat limited. GPS limitations may not be an issue if you’re trying to hit a target with a 5,000lb bomb but if you’re trying to place your hands on a deliberately concealed tupperware container in the middle of a thick forest it can be a challenge to search a ~100 square meter area. 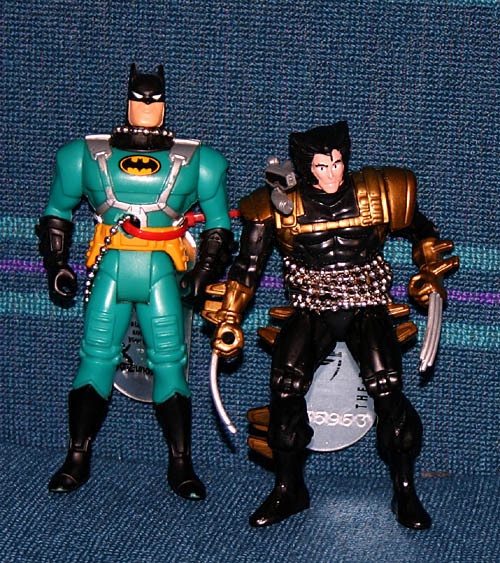 The reward for our efforts today is a pair of comic book action figures, Batman and Wolverine! We’re going to take them on our next trips and drop them off in caches along the way. These guys are extra cool because they carry “travel bugs“ (Batman’s, Wolverine’s) which means they’re tagged so we can see on the Web where they’ve been and keep track of where they go after we drop them off. 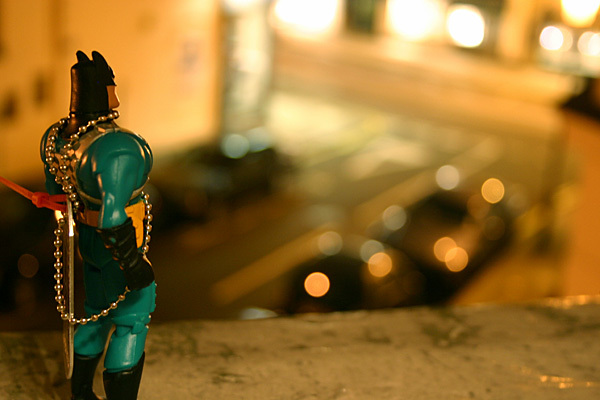 robot: why get leave the house when you can remotely guide a robot to the cache? I thought it would take a while to sort out all the mobile phone options here but it in the end it only took a couple hours walking down Oxford popping into the many phone shops lining both sides of the street. If you’re going to be here for less than 12 months you don’t want to be locked in to a phone contract so that leaves you with the “pay as you go” choices. Every phone operator has their twist on the concept but since many shops lay out all the plans from all the operators in a simple grid they’re easy to compare. To start off, we want the cheapest phone and an operator with good UK coverage. £39.95/~$72.00 (VAT included) for a Nokia 3410 (pictured at left) and service from T-Mobile. 30p/minute up to £10/mo, 20p/min up to £20, and 10p/min for calls over £20/mo. Cool things: no bonus taxes or surcharges, no charge for incoming calls, text messages, voice mail, or for checking voice mail. So if you’re only using a phone for incoming calls and messages the service is essentially free! They have this concept of ‘top up’ cards which you use to add money to your phone account. Ideally we would just have the phone company bill our credit card as needed but that is turning out to be tricky. They want the address the credit card is associated with to be the same as the address you register your phone with which must be a UK address and it’ll be a little while until we have one of those. Shaula has tried every trick in the book to avoid the effects of jet-lag. As the control subject in this experiment I haven’t done much except stay up late most days the past week finishing multiplayer Warfare Incorporated and preparing for the Big Trip. Here we see Shaula on the plane synchronizing her sleep schedule with GMT. I can’t sleep. Fortunately I have my cell-phone camera and an unwitting model to keep me occupied.